Hemel Hempstead Town won for the first time in ten league matches when they just edged relegation-threatened East Thurrock United 3-2 on Saturday at Vauxhall Road. It was the Tudors’ first league win since January 26 and their first home league triumph since December 8, much to the relief of Hemel boss Joe Deeney and the Tudors faithful. The prospect was never going to be easy as their Essex visitors, bottom but one in the table and fighting hard, had won two of their last three games in a bid to avoid the drop, beating Truro and promotion-chasing Billericay. The first-half was somewhat dour, however The Rocks should have been broken the deadlock first as they had the better of the chances and The Tudors can thank keeper Laurie Walker for keeping them at bay. He made three excellent stops, but his best save came when ex-Tudor Alex Osborn fired a shot from the edge of the box, where Walker superbly tipped it round the post. Hemel took the lead after a short spell of pressure when skipper Jordan Parkes and Herschel Sanchez Watt combined to set-up forward Arel Amu, who tapped home from close range on 40 minutes. It was somewhat harsh on the visitors but the Tudors wont care, having been involved in many games like this recently where they were made to pay themselves for not taking chances. Thurrock were reduced to ten men after 50 minutes when Ibrahim Sori-Diallo was somewhat harshly given a second yellow card but rather than hinder them, this seemed to inspire the Rocks. After escaping a near miss when Hemel defender Darren Ward’s shot crashed off the post, the visitors scored twice in as many minutes just after the hour mark. They forced a corner after a quick counter attack and with the Tudors’ defence guilty of ball watching, Sam Higgins headed home when unmarked. Then Ricky Hayles did the same, again from a corner, with the midfielder arriving unmarked at the back post. Deeney introduced new signing Mark Randall, who made an immediate impact, looking very composed in the centre of the park, spreading the ball out with some pin-point passes. It was a superb cross-field ball from Randall that led to Hemel equalising on 73 minutes when he sent Sanchez Watt clear. 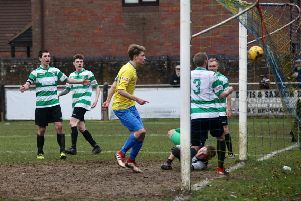 The striker was pulled down in the box by Jack Giddens and referee James Durkin awarded a penalty. Parkes made no mistake from the spot-kick to net his 13th goal of the season in all competitions. Then with seven minutes to go, Parkes grabbed the winner with a trademark free-kick that was deflected past the helpless Thurrock keeper to give the Tudors a much-needed win. The captain has now completed his own personal milestone, becoming the club’s all-time leading goal scorer with 109 strikes to his name in total. Hemel’s victory keeps them in 14th place in the National League South table. Deeney was obviously pleased and relieved post-match to have ended the Tudors’ recent barren run but reflected, saying his side have played better and lost this season. He felt that Randall was a big influence on the result and that is why he brought him to the club. The Hemel boss said he was very disappointed with the two goals conceded, but was pleased with the courage and composure shown by his players after the set-back, especially sensing the atmosphere in the ground, which was becoming one of frustration. He hopes to have striker Rob Sinclair (four goals in 14 appearances this term) back in the squad this week, which will give him a pleasant selection headache, one that he hasn’t had in recent weeks. Another three points is needed this Saturday when they host 16th-placed Eastbourne Borough and Deeney has every confidence they will achieve it to start moving back up the table. Hemel line-up v East Thurrock: Laurie Walker, Joe Howe (Mark Randall), Kyle Connolly, Jordan Parkes (captain), Darren Ward, Jacques Kpohomouh, Kieran Monlouis, Frankie Musonda, Jason Williams (Daniel Rowe), Arel Amu, Herschel Sanchez Watt. Subs not used: Kavan Cotter, Jack Snelus, Danny Boness. Tudors’ man of the match: Jacques Kpohomouh.